Sterling rose and stocks were steady after Theresa May’s defeat in parliament, defying fears of a crash. Assuming the prime minister survives a confidence vote, a softer Brexit or second referendum become more likely. British politics looks messy, but investors’ message is clear. 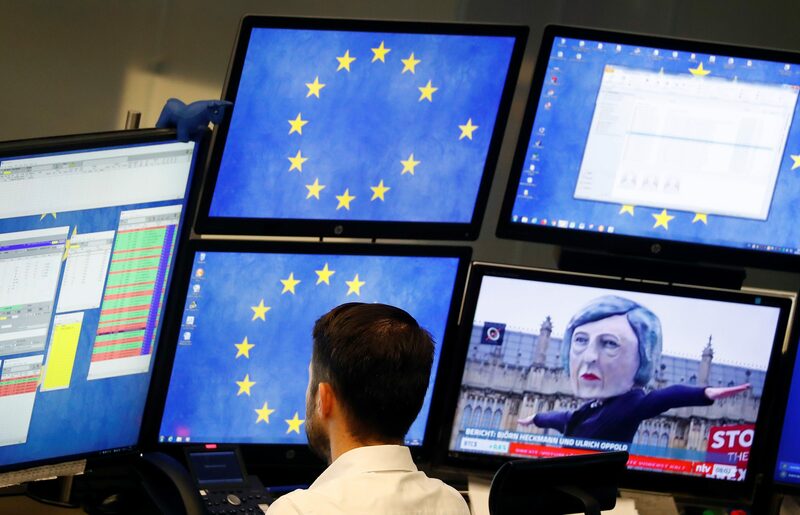 A shares trader checks his trading systems at the start of the trading session the day after the Brexit deal vote of the British parliament at the stock exchange in Frankfurt, Germany, January 16, 2019. Reuters: EU ready to discuss new Brexit deal if UK changes "red lines"
British Prime Minister Theresa May lost the parliamentary vote on her withdrawal agreement with the European Union by 432 votes to 202 on Jan. 15, the biggest defeat for a ruling party since 1864. Some 118 parliamentarians in May’s Conservative party voted against the agreement, out of a total of 317. Opposition Labour party leader Jeremy Corbyn called a vote of no confidence in May’s government after the defeat, which is expected to be at 1900 GMT on Jan. 16. Sterling fell more than 1.3 percent before the parliamentary vote on Jan. 15 to just below $1.27, but appreciated to $1.2823 afterwards. It strengthened slightly to $1.288 by 0922 GMT on Jan. 16.